Halfway between St. Paul and Mankato, Minnesota, following the Minnesota River and its valley, sits a prairie town with rolling hills and the "Great Woods" along its northern bank. In the late 1840's a few French fur traders made their camps home, and set up trading posts along this scenic river. Louis Robert was one of these historic men who survived bitter cold winters and enjoyed the freshness of a natural Minnesota. Judge Andrew Gould Chatfield was an associate of the Supreme Court by appointment of President Pierce. His territory was everything west of the Mississippi River. He was making his way, on a Spring day in 1853 to Traverse Des Sioux, to hold court. Following the Indian trails through the very dense forest, later known as the "Big Woods," he came upon a beautiful prairie located on the southern bank of the Minnesota River. The beauty of the land impressed him. In 1854, he returned and took claim of 192 acres, with the forming of a town in mind. This property is now the southeast corner of Belle Plaine, lying south of Main Street and east of Meridian Street. The following spring in 1855, he claimed another 320 acres, all of which is now included in our present town. He built a cabin for living quarters near where the old Sacred Heart Church once stood. Along with Major Robert H. Rose and William W. Smith, they laid out the town. The surveying was performed by W. H. Stoddard in 1855. The town was named from the beauty of the land "Belle Plaine." Shortly after laying out the town, Judge Chatfield, Major Rose and Wiliam Smith formed the Belle Plaine Company. It was incorporated with stock amounting to $100,000; 100 shares of stock at $1,000 each, and with this money, improvements were started. With the existence of the Belle Plaine Company, many buildings were erected and growth was rapid. A large number of lots were sold and our town was on its way to a booming start. The Minnesota River was very active with large paddle boats and barges arriving and departing. On a good day it might take 19 hours to travel from St. Paul to Mankato with a 12-hour return trip. Belle Plaine was one of many scheduled stops; it was a perfect place to come for a day, or stay for a lifetime. New settlers came every day. By late 1858, the country went into an economic depression and the Belle Plaine Company found itself heavily in debt. At this time Daniel Ingersoll took over all the unsold lots in Belle Plaine and the Belle Plaine Company dissolved. However, the Belle Plaine community had "roots" in hard-working, faithful people and a strong desire to see through many struggles. One of the first items to get established in early Belle Plaine was a post office; it being a small building near the Chatfield residence. Weekly mail was delivered. The grist mill, erected at a cost of $3,000, was constructed by the Belle Plaine Company in 1857. In 1865, it burned down and was rebuilt that same year by Dolittle & Norris, at a cost of $9,000. This mill was located on the bank of the river around where the old depot once stood, or about a block east of the old river bridge. George Sly erected the first sawmill in 1855. This was located adjacent to Brewery Creek, near where the present railroad tracks are today. It was a two-story building, partially built into the side of the hill giving the appearance of the second story being on the ground floor. It was constructed so the logs could be rolled down the hill, onto the carriage that put the logs through the saw mill. Another sawmill was erected by Dolittle and Norris along the banks of Roberts creek, just to the west of Belle Plaine. The Doolittle and Norris mill did not have a circular saw like we are used to seeing. Instead, it had one that worked up and down; it was known as a drag saw. A larger manufacturing plant was built in the latter part of the 1850’s situated about midway between the old depot site and the river. The structure was 40 by 125 feet, built on large pilings to keep in above rises in the river. Even then at flood time, the building would fill with water and cease operations. After two years it was moved farther inland to a higher ground. The plant manufactured plows, drags, fanning mills, large iron kettles, stove parts and castings for steam engines. The people of the town spent many an hour admiring all the larger iron and wood working tools in operation. When the plant did casting, many persons watched as the molten iron flowed in little rivers to the various molds in the sand. A Mr. Kaiser, who worked at the foundry, made a cast iron cannon weighing about 150 pounds. It being during the civil war, the cannon was brought out and fired every time news reached town that the North had won a battle. The cannon was placed near the intersection of our present Main and Meridian Streets, and it faced north. On one occasion, a David Smith was firing the cannon so rapidly that it got hot. While he was ramming in the next charge, it went off; David Smith lost two fingers. Rumor had it that it was secretly buried under one of the streets, so that someone wouldn’t get hurt due to an accident. It was stated that an overcharge in cast iron cannon would cause it to explode, with very serious consequences. The foundry burned down in the 1880’s and was not rebuilt. The first brewery was established in 1860, by an Anton Swingler. It was built near a site along Brewery Creek, about 200 yards to the east of the present railroad bridge on Highway 25. It produced beer until it burned down in 1866. Near the same site, another brewery was established by Christian Schmitt in 1871, and the business was carried on by his sons John, Peter and Matt. This brewery was in prime, well into the 1890’s. With competition from the larger breweries, local breweries began to decline. 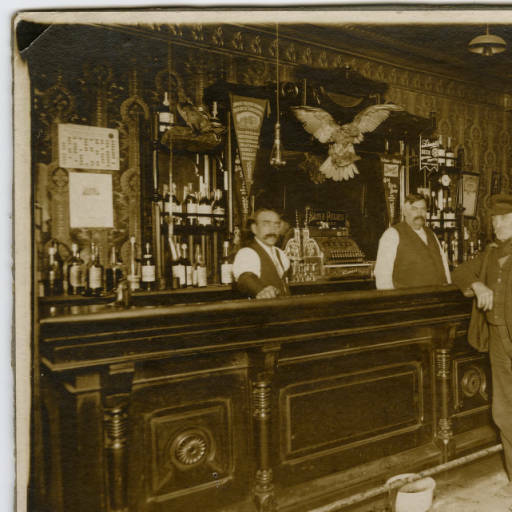 The Schmitt Brewery in Belle Plaine continued in business into the 1920’s. Among the other very early industries in Belle Plaine was a stave and barrel factory. This business flourished from the time of its inception in 1866 to its close in about 1874. A very short-lived venture was a hop yard, which ran from 1867 to about 1870. Brick making was a very important early industry because of the natural materials available, the simplicity of producing bricks, and the demand for cheap and fireproof building material. 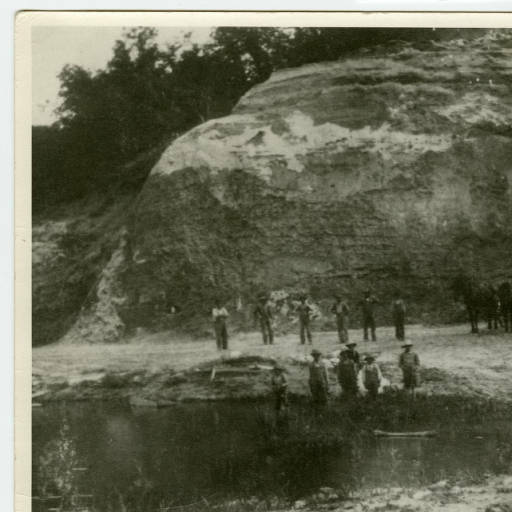 There were several clay deposits to be found along the Minnesota River, ideal for the manufacture of brick. The first brickyards produced brick intended for building chimneys by the early settlers. They were discovered prior to the civil war. In the late 1860’s, Jacob and Martin Krenz opened the first big brickyard which produced a very good quality of red brick used in building several of the downtown buildings. In 1901, the Becker Brickyard shipped an even hundred carloads of brick. About 22,000 bricks a day were processed by a team of 20 to 25 men. When Mr. Becker passed away, the business was carried on by his son-in-law, Joseph Albrecht, Jr. After a time, the accessible clay diminished, operations ceased and today you may drive by and hardly know that it was once a brickyard. One of the biggest days of the year was the annual 4thof July celebration. This was usually sponsored by the local park. Various games were held, such as foot races, tug-of-war, watermelon eating contests and horseracing. 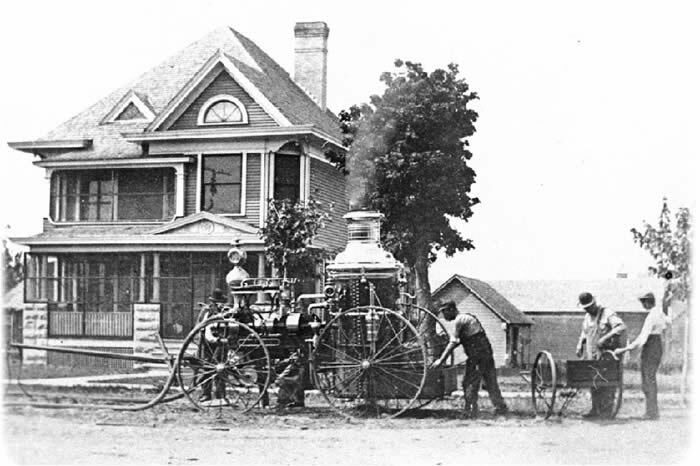 In later years the Belle Plaine Fire Department was in charge of the evening fireworks. This job was taken on by Alf Albrecht who performed the task for many years. Most of the horseracing was done right on the streets, starting just east of town and the finish line was first house on Main Street. There was also an oval race course in town. This was near the site of our present baseball field. The judges’ “lockout” was very near the present school superintendent’s office. It was about a half-mile distance around the course. Another very popular series of events were local plays put on and directed by local talent. These were first held at Weiberler’s Hall, which was upstairs over the present video store on the corner of Main and Meridian. In later years, they were held in the Roseland Ballroom, which was upstairs over the present Keup Chevrolet/Buick dealership. In the very first years of the development of Belle Plaine, all drinking water was carried from springs located in the close proximity of town. Water was also caught in barrels and cisterns for other purposes. A community well was established in the middle of the intersection of Main and Meridian, with a pump and drinking trough. This was used for a few years, until it was discovered that the water was being contaminated by animal manure. Cattle roamed the streets at large in those days. A new and deeper well was established in the same location, and an enclosed tower was erected, with a windmill on top to raise the water. This was done in 1889, at a cost of $550. The entire structure was painted on all four sides with the advertising of patent medicine called Kickapoo Indian Medicine. Water was restricted to one barrel at a time and not more than two barrels per day for an individual. Anyone violating this ordinance was fined $5. The old well stayed in existence until 1908. In 1907, the town started construction of a public water works. This consisted of a tower 110 feet high capable of storing 55,000 gallons of water, a pump and pump house, water mains and fire hydrants to serve the central part of town. Total cost of this entire project was $8, 786.